www.HoffySwims.com: My swimming adventures just keep getting better and better! My swimming adventures just keep getting better and better! 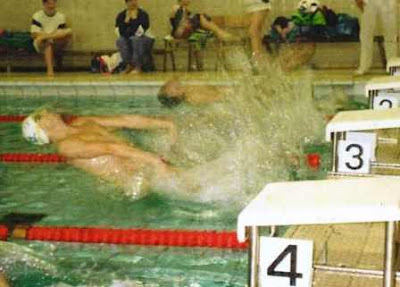 In the early 1990's I competed in a 100 Metre backstroke race in my late 20's, and during the start (pictured above), I trapped a nerve in my neck which all but finished my swimming career. 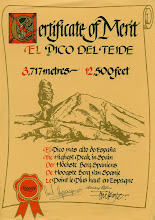 It took 18 months before a massage finally released my trapped nerve in my shoulder while on holiday in Fuertaventura. I came back for a while, but never regained my competitive edge, and finally finished swimming for the Bury St Edmunds Swimming Club at the Suffolk Championships in which the GB swimmer Karen Pickering also competed. I was 31 years old, and never in a million years did I ever think I would swim in any serious manner again. 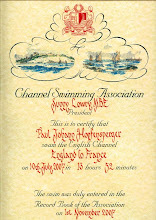 Having decided to swim the channel in 2006, the rest is history, except for one extraordinary thing which has happened in the past couple of weeks. "What could that be?" I hear you ask. Well, it's simple. I had a conversation with 'King of the English Channel', Kevin Murphy. "So what!" you might say. Well, this is what happened. 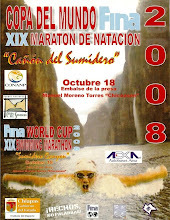 Yes, it was a FINA World Cup Grand Prix event. Not a masters event, but an actual World Cup Grand Prix! Being a Formula 1 fan, I had immediate visions of me in a 125cc Go-Kart, sat at the back of the grid at the start of the Malaysian Grand Prix, with Kimi Raikonen (Ferrari) and Lewis Hamilton (Mclaren) at the front, and me in the go-kart at the back! That's what I pictured in my mind. I was not far out. 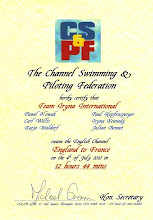 Investigating further, I found out that last year's winner, was none other than English Channel World Record Holder, Petar Stoychev, followed by some other very good and serious swimmers. All of them, possible medal contenders at this years Beijing Olympic Games. I am 45 years old, and most of these swimmers will be 15+ years younger than me. There was no way I would be accepted. Going through the quite long process of form filling, liaising with Joanna at the ASA, Vojislav Mijic in Serbia, airlines etc., I am delighted and astonished to say, that I am now competing in this event! I honestly can't believe it. 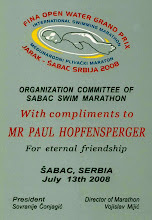 The swim is a 19KM river swim in the River Sava in Sabac, Serbia. It will be a fantastic thing just to compete in this event, and is something I would never have even imagined let alone thought possible 2 years ago. It just goes to show, you should never say never! 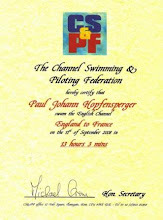 It will be fantastic preparation for my Jersey to France and Two Way channel swims. 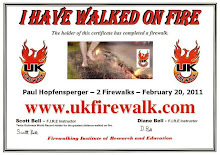 I will report back after the swim in July.